1001 Kitchen Tips #69 - What can you substitute for buttermilk in soda bread? Can't find buttermilk? Annoying huh? The Cotswolds is amazing, but finding ingredients can be more time consuming and involve further distances - as with everything there are good sides & bad sides. The good far outweigh the bad! It's annoying too sometimes how shops keep changing their stock - sometimes they'll have certain ingredients, you go another time and they've discontinued it - as was the case with buttermilk. Soda bread 2009 (above) - one of the most popular posts I've done - testing the difference between water and buttermilk in soda bread, see more & the 2 recipes here. Soda bread is the answer for guests with yeast allergies. Back to 2012, and the soda bread I made last Saturday. As I didn't find any buttermilk, I searched for a substitute, and found the answer to be acidulated milk. It's always worth reading the comments under recipes - sometimes the measurements in recipes can be wrong slightly and people who have tried them give helpful hints below, or things they would do differently if they made the recipe again. Sometimes the comments section can be the difference between trying the recipe out or not! 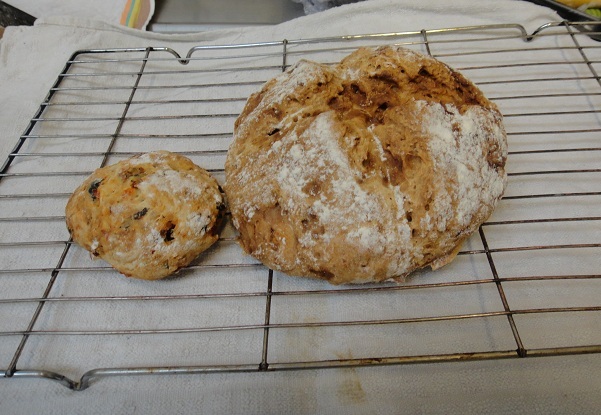 Little & large soda bread. The sun dried tomato, olive and thyme roll was for the dinner party that night and plain soda bread loaf for breakfast. Underneath this soda bread recipe was a handy hint - use the same amount of milk as buttermilk (500ml in this case), heat the milk up gently and add 2 tsp lemon juice and let it cool. It makes a lumpy yogurty like mixture - but works just the same. And it did - above. And you know what - cheaper too! Amazing I didn't know that acidulated milk can be a good replacement in buttermilk. I must try this one.